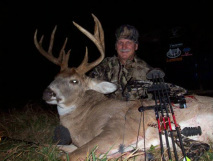 Discounted Big Trophy Whitetails Deer Hunts in the Famous Golden Triangle. This area speaks for itself in every hunting magazine you read. Big trophy bucks moving through timber surrounded by corn and beans making them huge, Come to the land of Lincoln and the area of big trophy whitetails.Big Illinois buck are yours for the taking. Don’t miss out this outfitter book full early every year. This outfitter is dedicated to improving your hunting adventures year after year. Currently hunting close to 6000 acres of locally leased private farmland and we are continually adding new properties each year. On some of our properties, we have food plots designed specifically for the whitetail deer and the wild turkey. All other properties are basic farmlands with a variety of terrain from hardwood ridges, CRP fields; river bottoms open fields with grassy draws, etc. Each property has an abundance of grain crops such as corn, soybeans, wheat, oats, clover, CRP plots and alfalfa fields. PRICES START @ $1900.00 Lodging Included .PER HUNTER FOR THE WEEK. Missouri, Kansas, Nebraska Deer Hunts also Available go to our special categories page. To request more info or to book a hunt pleases fill out form below.